Description: PDPU invited for Junior Research Fellow (JRF) Posts under various projects. 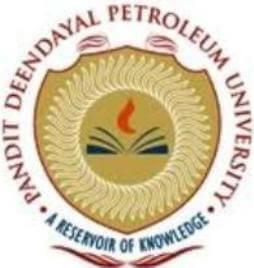 Pandit Deendayal Petroleum University - PDPU published an official notification for Recruitment of Junior Research Fellow (JRF) posts. Eligible candidates can apply for this recruitment. You can view more details about this recruitment including No. of posts, name of post, Educational qualification, Age limit, Selection process, How to apply etc... You can also view official notification and other important facts about this recruitment e.g. Important links and Important dates. M.Sc. from a recognized University in either of the following disciplines: Chemistry, Physics, Materials Science, Nanotechnology. Additionally, the candidate is required to possess a valid CSIR-NET qualification (JRF/Lectureship) or GATE score. Desired Skills: Experience in solution chemistry, thin film, bulk and nano material preparation, Vacuum techniques, Modern Analytical techniques and tools used in material science. Please note that your CV should clearly mention contact details (address, phone no., email ID), date of birth, qualifications and details of experience (with name of organization/institute).